SYMPLA is a professional modular video rig system that extends and complements new cameras, allows for stable support and framing, supports essential accessories features, offering versatility and high performance as well as comfort, safety and much simpler and faster set up than existing rigs. SYMPLA's Camera Body Support and Lens Support help create a more stable, vibration-free platform for..
Sympla Flexible Mattebox Kit is a “ready to go” solution that includes all the necessary pieces insi..
SYMPLA is a fully customisable component rig system, but a limited number of pre-configured kits i..
150mm (5.9'''') long Rods are one of the basic building blocks of all SYMPLA rigs, and are always us.. These 300mm (11.8'''') long Rods are one of the basic building blocks of all SYMPLA rigs, and are al.. 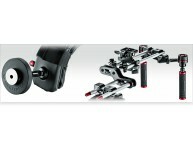 The SYMPLA Shoulder Pad component gives a SYMPLA video rig a solid point of contact and support for ..
Sympla Shoulder Support Kit is a “ready to go” solution that includes all the necessary pieces insid.. The multi-purpose Universal Mount is a self-hanging clamp that slides along SYMPLA rails and locks i.. The Vertical Offset component is made up of two Universal Mounts with a height-adjustable spacer ele..
At the heart of the SYMPLA system is the Plate, which attaches your camera to the SYMPLA rig and mov..